Well, ok, maybe I’m not all the way gone. But who knows? I recently got a smartphone, and it has fundamentally changed the way I interact with the world. At this point, it is still a magic box, but from this point on it’s going to become normal. So, I’ve decided to document this transition on the basis that this will never happen to me again. It’s a magic box – I have the internet in my pocket. I wake up in the morning and check my email while my brain wakes up; then I get out of bed. Sitting in class, I can Wikipedia a concept that the professor is talking about without having to get out my computer, boot it up, and be noticeably not paying attention. In fact, booting up my computer takes so much longer that I haven’t bothered to log into email on my computer more than a handful of times in the last half-week (I usually check email online every 2-3 hours at minimum). This really helps with dealing with all of the small I-don’t-need-to-read-this emails, but I’m slower at responding to “real” email because of the small screen and less efficient keyboard. Having an Android phone has allowed me to install Google Voice on my phone, which has in turn led to free, infinite text messaging, and my willingness to text people has skyrocketed. SMS conversations no longer end with “I have limited texting” and “Oh, sorry :(“. I also have a hardware GPS chip and unlimited data – Google Maps on my phone, in my pocket. I found this particularly helpful last night, while trying to locate the Awesome Foundation party that I was going to. Alone, having never been to Microsoft NERD before, I was able to not only navigate there with phone-based GPS, but also double-check the specific building address once I arrived by navigating to the event’s Facebook page on the fly. This worked a lot better than trying to call my friend, who was already there but failed to answer his phone. Overall, this is a very strange experience. It’s completely changed the way I interact with the internet, and is starting to bleed over into my real life. It’s like I’ve stepped into the future – a device that used to call and maybe text people has become a 24/7 uplink that tells me where to go, what my friends are doing, whether or not anyone is trying to talk to me (in 3-4 different formats! ), and knows where I am. The really crazy part is that this is becoming normal. (Again, cross posted from my personal blog, here). I wrote this essay specifically about the 2+2, because it has impacted me the most. While I haven’t experienced it in another situation, this could be true of anytime you know you’re going to a grad program, moving, changing jobs, etc. Sheryl Sandberg gives fantastic career advice. Admittedly, I’ve only ever watched two talks, but both were great. In one, she pointed out three things women should to help equalize career gaps. One of those three was “don’t leave before you leave.” By “don’t leave before you leave” she explained that you shouldn’t “off-ramp” your career. Unless you’re actually on parental leave, you shouldn’t start preparing for parental leave, or stop seeking new opportunities, or giving up things too fast. Unless you are actually stopping work to have children, you should keep achieving at the same high level as always. Her main point was that you don’t actually know what you’ll want until you get there- and if you’ve already made your career less excellent by off-ramping, you’ll be even less likely to want to stay. It’s like you’re giving up on your career before there was event a choice to be made. For some reason, that particular statement stuck with me. I’d walk around work, and whenever I was feeling frustrated “don’t leave before you leave” floated through my mind, and I’d buckle down to get back on whatever arduous task was bothering me. Yes, for anyone who knows me, that’s probably baffling. I’ve never had any desire to stay at home once I have children, and I’m not planning on having children anytime soon. It wouldn’t really be what you’d expect me to remember from that talk. I might not feel exactly the same way when I’m 28-30, but I can cross that bridge when I come to it. So why did that point stick with me? “Don’t leave before you leave” doesn’t only apply to having children. It applies to any situation where you might be considering making a change. Maybe you know you’ll need to move cities, and find a new job. Maybe you don’t like your job, and you’re looking for a new one. Anytime you’re considering leaving a career, it’s easier to say “oh… well I won’t be here to deal with the repercussions of this.” The scarier part is that it’s not even just for children – it’s true for all of life. When I moved to Seattle, I already knew I was leaving to go back to Boston for business school. I briefly considered only subletting apartments so I’d never have to find a real one. i considered not buying any furniture, dishes, or really anything. I figured two years wasn’t long. I could totally live on an air mattress from two years. I even briefly considered not making any friends, because I was leaving anyway. I could just work all day, every day, for the two years. I was afraid of having to leave a life I actually liked, so I decided the solution was just not to make a life. Luckily, I came to my senses on that particular front, and now have a lovely home with three great friends, furniture, nice kitchen equipment, and basically anything I could need. Oddly, I didn’t apply the same logic to work (priorities?) I knew I was leaving. I told everyone around me, and often people asked me “well, then, if you know you’re leaving, how do you stay motivated? how do you think about work differently?” It hadn’t really even occurred to me that I wouldn’t take my career seriously, until people asked. I’d always just assumed i was staying for two years, and doing work, and that was that. I had after all, moved to Seattle to work. My career wasn’t what I was going to leave too early. So keep in mind that “don’t leave before you leave” doesn’t just apply to work. It applies to your life. Live your life knowing that things change quickly, and in two years things might not be the same. Put your all in at your job, but also keep your eyes open and change jobs when it’s worth it. Join groups in the community, explore other possible careers, and make friends. The 2+2 affords you a very great opportunity to take risks. In two (or three) years, you get a full reset. You can take advantage of this – it would be okay if I had a startup and failed, because I’d get a reset. But the same knowledge could also make you not even try the startup, because you know you’d only have two years to dedicate to it. The advantage of being able to take risks can be very easily outweighed by the knowledge that you’re leaving. It’s scary to invest when you know you’re leaving, and it doesn’t always make you make the right decisions or take the right risks. So go for the 2+2 – but forget that you’re part of it. Be pleasantly surprised in two years when you realize you can go to school, and only go if it’s the right choice for you. When you’re starting, don’t think of yourself as leaving in two years- you’ll be too tempted to leave before you leave. * For those of you who don’t know, I’m part of the Harvard Business School 2+2 program. You apply to enter the program before your senior year of college (it’s changed a little now, but that’s how it was for me), and find out if you’re admitted by September. You finish your last year of school, work for two years (doing basically whatever you want), and then do the standard full-time HBS MBA, with all the regular admits. For those of you keeping track at home, this would mean I would typically start next fall. Based on my life right now, I chose to defer an additional year, and will be starting in the Fall of 2013. (Cross posted from my blog, here). If I had to pick the one thing that I wish school managed to do for everyone, it would be instill a love of reading. I remember knowing I had to learn how to read, I remember reading in class, I remember people saying reading was important, but I don’t remember people at school ever saying that reading was fun. For some reason, for me, it was. I think that it’s because my parents read to me every single day before bed (i still feel a bit odd if I don’t read before bed). They read a huge set of books, most far above my reading level- The Hobbit, Lord of the Rings, Redwall, Narnia, His Dark Materials, and probably a million I’m forgetting. One of the few times I remember being extremely upset was a time I was watching my dad read my brother Dinotopia, while waiting for my mom to come read to me. She thought I was entertained listening to my brother’s book, and decided it was bed time, and I didn’t get to read part of mine. I cried for at least an hour, and wasn’t placated until she read a chapter. Reading was a huge part of my life, but because it was instilled while I was at home. So as I’ve gotten older, I’ve realized more and more that the love of reading was the most important thing I learned. Love of reading was important because it means that I read continuously. Here are all the things my love of reading has helped me with, and why I think it’s the most important (school-related) thing for a child to learn. Reasons 1-3 all relate specifically to language, but 4-5 are more broad. 1. Spelling – I was never great with spelling growing up. i still can’t spell out loud. But when I’m writing, I can tell immediately if a word is correct or not. It looks right or wrong because I’ve seen it written so many times. 2. Grammar – People’s brains are great at pattern matching. Like with spelling, I’ve seen enough written sentences to know when mine flow. 3. Vocabulary – When you read, you aren’t just memorizing vocab words like you would be with SAT prep cards. You see words in context, repeatedly, and now that we have great ebook readers, you can even define words without breaking your flow. 4. Communicating Ideas – The more things you read, the more times you’ll see ideas that are communicated well, or horribly. Being able to sense what helps get the point across helps you communicate your ideas better. 5. Learning – Reading is a great way to learn about a discipline. Not everyone is the type of person who learns best through reading, but I believe almost everyone can learn through reading, and the more they read, the easier it will get. Loving to read gives you a tool to start a foundation in a field – you can read a book (relatively low investment) before deciding to take a full class, reach out to an expert, or take another drastic step. Reading is the gateway. I wouldn’t be anything like I am today without reading. I wish we’d instill a love of reading in kids, instead of an obligation to read. It’s probably the best advantage we can give them. When I first heard about the Awesome Foundation in Boston, I was skeptical. I didn’t want to just give away (a lot of) money for no coherent reason. i wasn’t sure who would apply. I was afraid it looked like trying too hard to be cool. It seemed frivolous (although that didn’t stop me from going to the parties to see some cool people). 1. The Parties – Awesome parties are unlike any other type of event I’ve been to. Conferences are formal, bars aren’t where you meet people to network, and most meet ups are segregated by “tech,” “art,” or some other boundary. Awesome Foundation parties are the type of event where anyone in the community can show up and hopefully feel at home. This might not be entirely the case yet, but I know we’re striving for it. I think it’s one of the first places that’s really shoving everyone with cool ideas in an area in one place. 2. The Trustees – The trustees bring together a group of people who might not otherwise know each other. Everyone brings a different giving and planning perspective to the table. I’ve learned a lot more planning the Awesome Foundation events than I have events that were just in my field. The nature of having rotating guest seats means even more people, and more opinions. 3. The Project Proposals – Getting to read a bunch of different proposals sparks more ideas. I see more crazy things, and have more crazy thoughts, now that I dedicate a few hours every month to just reading ideas. I’m pretty sure I wouldn’t be so focused on writing now if it weren’t for all the proposals that center around writing. All of the ones around art remind me how large-scale art can be. It just brings the spectrum forward. 4. The Organization – It’s really hard to run a lightweight organization- much harder than a bureaucratic one. Who organizes the applications, but doesn’t feel burdened? How do you run the meetings and still hear everyone? How do you have a regular schedule without stifling things? It’s an experiment in organizational minimalism that I think I’ll be able to take away. 5. The Grants – Finally, the grants. I wasn’t entirely sure how they helped at first, but much in the spirit of #3 (The Project Proposals) the grants help others in the community to see awesome things. It’s not just me who gets inspired to have more ideas, and when more people see them (and apply in future cycles, or not) it can help create more awesome ideas. The Awesome Foundation is a huge motivator for me personally – I have more ideas, I think more about interdisciplinary work, and I strive to see how to make other things more lightweight. But I think the biggest thing is I’m hoping this effect goes further than me, further than my influence network, and throughout the community. (Cross posted from my blog). Talk to elementary schoolers, or even high schoolers, about math. They’ll break down pretty neatly into a group that likes math or is “good” at math, and a group that is “bad” at math, or doesn’t like math. The group that is “bad” at math won’t think there’s any problem with this- they’ve been surrounded by adults who tell them that it’s okay, that lots of people are bad at math, and that you don’t need math do well in the real world. Sure, I’ll be the first to admit not everyone needs to learn Differential Equations to function in society. I learned them, and I never use them. The same may be true of calculus. I won’t use either discipline much as I do day to day work. At the same time, I’m not sorry I learned them. There’s something substantial to be said for 1) learning how to do something that’s very hard and 2) learning how to do something that’s very abstract. Both of these skills help you learn how to learn better, and shape your thinking in different ways. Math can teach that in some fields, there are right and wrong answers. Learning math is very valuable for learning how to learn. What we don’t point out, is that the same is true of the type of writing we emphasize in school. Yes, we need to be able to communicate with others. Most of the writing taught in school is literary analysis, and like differential equations, no one has asked me to do it since high school. Writing is important because it teaches that society isn’t black and white- that you need to take inputs from a variety of sources and process them to figure out what you think is true. You need to be able to communicate your ideas to other people. So just as math can teach abstract thinking, writing can teach synthesis. However, by the time you’re at late high school or even during college, most of the learning isn’t for a specific skill set, be it DiffEQ or literary analysis. So why does the educational system only value one of these types of thinking? Abstract thinking and communication/analysis skills are both important. We force engineering students to take at least 28 credits of humanities (about one course per semester) in the name of being well rounded. Despite this, we still scorn engineers for being “black and white” or not interacting with people well, despite taking courses on both ends of the spectrum. We never do the opposite- we don’t force humanities students to have this same breadth by considering analytical and societal problems. We consider being “well rounded” for a humanities student to have specialized in one field, like history, and also studied a language, psychology, or sociology. These fields have much less distance or diverse skills, yet we frequently call these students well-rounded. Math shouldn’t be optional- it’s a valid part of a complete education, just like writing and reading are. If we’re going to say we want well-rounded students, let’s make sure we follow through on what well-rounded really means, and teach students the full breadth of the spectrum, not make excuses for them. I didn’t originally plan for my first essay to be an essay on writing essays. However, I think it’s important to share why I’m embarking on writing one essay per day, for every day in December. I spent all of this November writing. I wrote over 50,000 words. I’d been meaning to do it since 6th grade- the year I first heard of National Novel Writing Month (NaNoWriMo) on open diary. The goal of NaNoWriMo is to write an entire novel (50,000 words) in a month. I hadn’t ever managed to successfully do it, despite stating that I would for 12 years. Every one of those 12 years I intended to write something, be it a fiction novel, a biography of myself, or a nonfiction book on why people should take sabbaticals. This year, I didn’t give myself a directive – I just said I had to write 50,000 words by the end of the month. The 50,000 words ended up being a combination of memories, opinions, feelings, and day to day happenings. At the end of the month, when I read back through them, I realized I needed to do more with writing. There was a lot of content in my 50,000 words- stories I hadn’t ever told anyone, ideas for fiction, and half written opinions. I wanted to get better at expressing myself. So on November 27th, I decided that for December, rather than trying to re-edit my 50,000 words into a book, I’d work on writing one solid essay every day. I figured essays would force me to consider and solidify my opinions, and force me to only hold opinions that I’m able to express well. I looked into writing essays- I started “How to Live,” a biography of Montaigne. Montaigne was the inventer of the essay (from the French, essayer, to try). Montaigne wrote to understand himself better. I read Scott Berkun’s Mindfire. I brainstormed a list of topics I thought I would be good at. I refused to write essays beforehand, so I’d be even more anxious and excited to get started. I waited for December. You may now note that it’s now December 3rd, and not December 1st. The first couple days of the month I realized that I start writing an essay, get halfway there, and stop, because it wouldn’t be good enough. I’d start with one idea, and then tie in twelve others, and then it would be too long and confusing to be readable. I am terrible at putting my opinion into solid writing. So in the next 28 days, I will share 30 more essays. They might not get better each day, but I hope essay #31 is substantially better than this one. I was never one of those kids who tinkered. I didn’t take things apart or rebuild them or concoct mad experiments. When my parents bought me Lego sets, I followed the instructions. It wasn’t that I wasn’t creative – I built entire worlds with my younger brother, played out elaborate stories with my toys, and drew constantly. In my mind, the world was segregated into very clear categories of “do” and “do not” change. Art was in the do category, because the point of art was to make a drawing or a painting or a clay sculpture from an idea in your head. Most other things were in the don’t category. It wasn’t until college that I realized there was any other way to think about it. Maybe getting thrown into building circuits or writing Matlab simulations should have done the trick, but Nerf guns are what ended up changing my life. Nerf guns were all the rage on campus my freshman year, so the first time I made it out to Target with some classmates I made sure to pick up some foam armament. Just having the Nerf gun wasn’t enough though – you had to modify it. I wasn’t so sure about this, but it was what everyone was doing. The implicit rules of my social sphere said that I ought to take my gun apart and shove some pennies behind the spring, so I did*. I grabbed a screwdriver and a handful of change, and set to work on my desk. I probably looked up a few tutorials online. A short while later, with almost no blood, sweat, or tears, I had a functional gun that shot twice as far as it had. This blew my mind. In following the implicit rules of my friends (“mod your gun!”), I had broken the explicit rules of the manufacturer. I had changed something that was not to be touched. And it had worked better afterwards. This prompted a spree of experimentation, a “CHANGE ALL THE THINGS!” phase, if you will. Part of this process involved failure, but I learned how to work around that. I crippled my Nerf gun trying to create a more directed airflow. I had to get my computer reimaged multiple times. I wrote all kinds of hacky HTML. But that didn’t matter, because I had finally realized that the rest of life wasn’t actually that different from art. My life became a blank canvas. I could see the rules and structures that governed everything around me, just as I had before, but now I had the power to change them. I’ve been struggling to write this for quite a while. I know the story, but it’s hard for me to figure out where I’m going with it. It wasn’t until I saw a talk by UW Professor Beth Kolko about her research on creating functional, not accredited, engineers that everything clicked into place: I want to tell this story, because I want people to read it and understand that they can also be makers and doers. All too often the story of being a maker gets told by the tinkerers and hackers – the people who were making robots out of the toaster and building their own websites by the age of 8. And that’s great. That’s fantastic. But we aren’t all those people, and furthermore, those aren’t the people who need to be told that they too can change the world. This is for the rest of us. * If you can’t tell by now, I’ve always been good with rules. My mother jokes that I was born on my due date because I didn’t want to start off out of line. We decided to take a little more of a lighthearted approach this week. 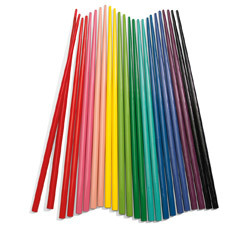 We were excited that we had a brand new set of rainbow chopsticks courtesy of my grandmother, and wanted lots of reasons to use them! 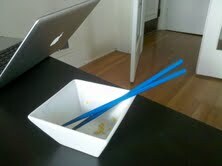 For eating meals at home we mandated that we could only use chopsticks (and spoons- chopsticks don’t work well for liquids). If you want to get your own set, they're from MoMA. Honestly, this one might have been a little too easy. Both Nikki and I are fairly accomplished chopstick users, and it turns out if you can eat Chinese take out with chopsticks, eating pasta and eggs is also no problem. It did go pretty well with our ongoing effort to try to cook more (and more complicated) things in our home. This week alone we made pasta, chicken teriyaki, and eggs and bacon! For those who haven’t heard, as a sneak peak, in the future you might hear about the cooking game we designed. The more fun part with using the chopsticks was having our friend Eric over to dinner. 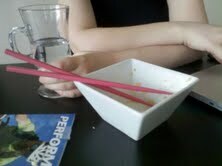 Eric is… not so proficient… with chopsticks, and we attempted to teach him. He ended up reverting to the spoon, but it was an interesting lesson in teaching. I use the pink chopsticks! Nikki uses the blue chopsticks. We’re both designers, and we care a lot about how design is done. We decided that it would be pretty swanky to sit down and write a manifesto about design. We started by sitting down with a whiteboard and brainstorming out all of our thoughts about design – principles we follow, design concepts we like, lessons we’ve learned. Not all of them were specific to design (for example, “don’t be afraid to ask for help”), and they didn’t all tie into a centralized concept, but it was a great starting point. Once we’d gotten our gut reactions down we talked about what we wanted our manifesto to look like and tried to tie our various thoughts into a coherent story. We believe that design is so firmly rooted in process that it’s impossible to write a manifesto just about the results. It needs to be about everything that goes into the product, not just the end result. Great design concepts can come from a software engineer who writes C++ all day or an elementary school student, as well as user studies and brainstorming sessions. Start with ideas and problems. Ideas are snippets of inspiration that come from your personal toolbox – projects you’ve done before, papers you’ve read, people you’ve met – as though you’ve been scrapbooking in your mind. Don’t be afraid to transcend boundaries. Add problems to this mix: things that clients have asked you to figure out, difficulties you have personally run into, and big picture problems that you want to solve for the world. Let these ideas and problems float around in your head together, drawing connections between them. If you have an idea, what problem is it solving? If you have a problem, what ideas does it inspire? Switching between these questions will crystallize the What and Why of your design. Bring your Hedgehog to life. 1) Make it a game. It doesn’t need to literally be a game, but you need to treat it like it is one. Make sure it’s fun and has some type of addictive hook to it. 2) Make it look good. Design isn’t just aesthetics (a beautiful exterior won’t fix a flawed interaction), but it does require aesthetics. Figure out your visual design language and stick to it. Being able to tell the story around your product – from the beginning problem it solves to why it helps the users and why it’s the best version of the product – is crucial. Communicating your idea so that it can and will be used is just as important as the product you’ve actually designed. Welcome to our second Double Dare! 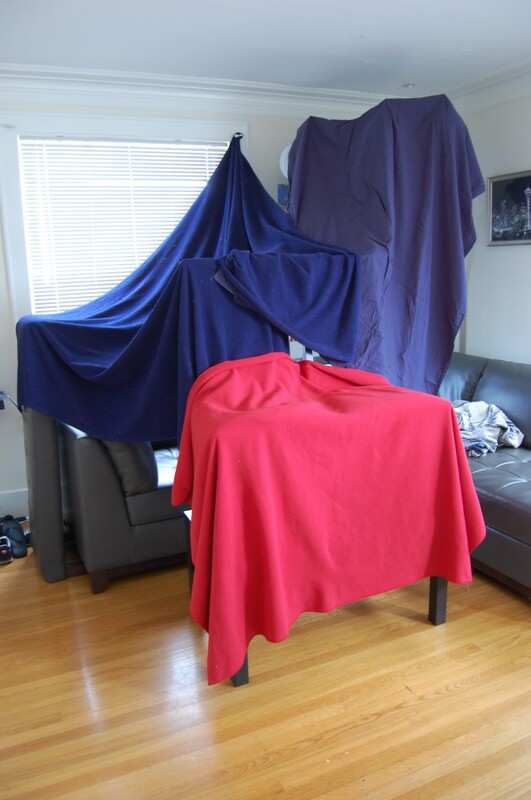 This week we doubled on two (admittedly unrelated) activities: trying out a supertaster test and building a blanket fort. For those of you not in the know, a supertaster is someone who is extra sensitive to taste. Due to my extreme sensitivity to bitter flavors (don’t even get me started about beer and wine), we’ve long suspected that I might be a supertaster. Doing a simple saccharine test seemed like an easy way to address the issue. The test itself is very straightforward: mix a packet of saccharine (we used Sweet and Low) into a glass of water, and then take a sip of the resulting concoction. 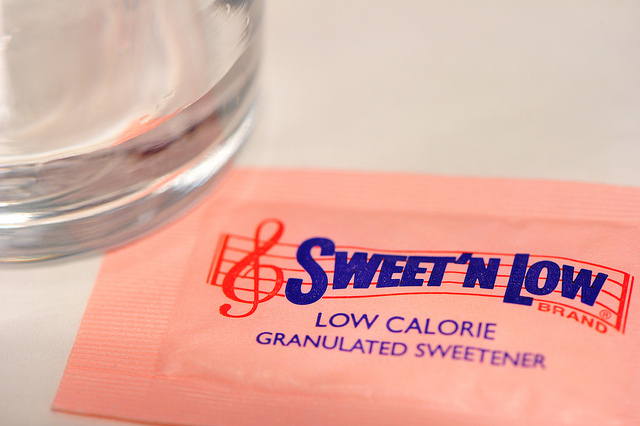 To a normal taster, it should be mostly sweet with a somewhat bitter aftertaste. To an undertaster, only the sweetness is noticeable. And to a supertaster, the bitter aftertaste is dominant. Keeping all this in mind, we mixed up our glasses of saccharine water and sipped away. To Ellen, it just tasted like sweetened water, implying that she is either an undertaster or a normal taster. To me, it tasted like sweet water – with an absolutely disgusting bitter aftertaste. Looks like I’m a supertaster after all! 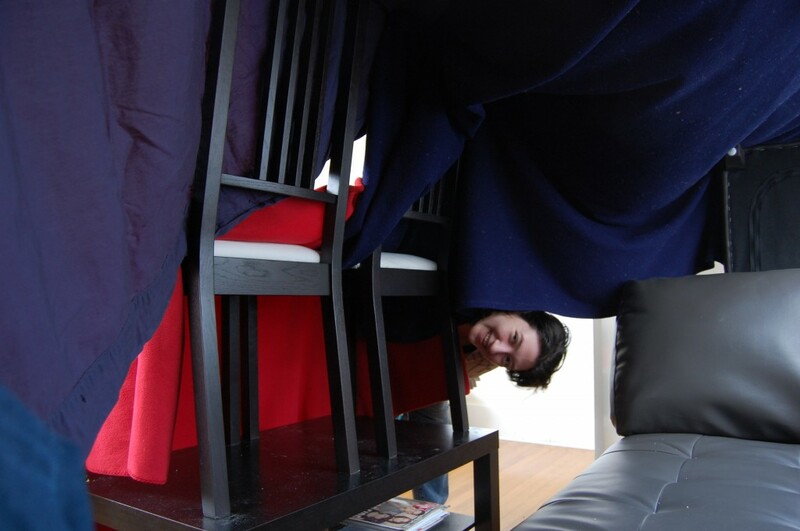 After our sugary adventures we decided to construct ourselves a blanket fort. We think it turned out pretty well, and we’re definitely planning on sleeping in it tonight! Part of the way through the build process! The view from inside our fort. 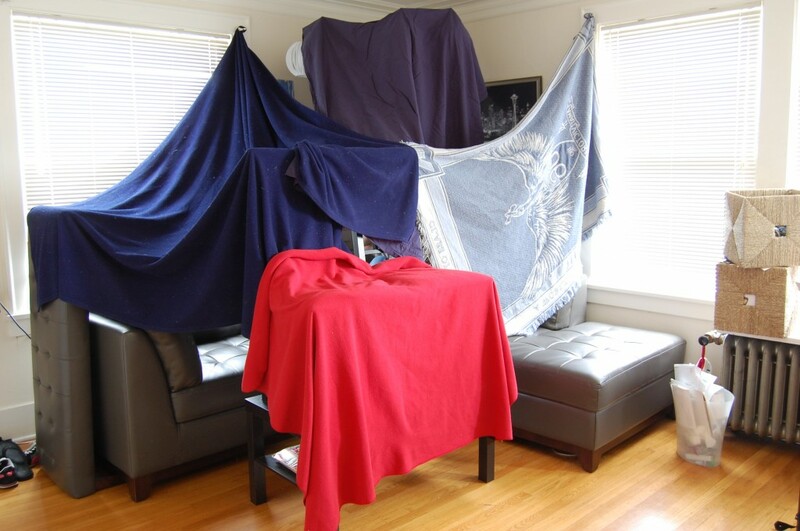 Our final blanket fort! It's pretty awesome inside.